An opportunity to do more. Vision Australia has a clear purpose – to support people with blindness or low vision in living the life they want. And that’s exactly what they do for almost 30,000 Australians, through services as diverse as radio stations, low vision friendly websites, and Seeing Eye dogs. Making a difference is in Vision’s DNA. But when it came to making a difference to their own culture, they decided a little extra help would go a long way. Macquarie Telecom could provide that help. When Vision Australia’s People and Culture team first started talking with Macquarie Telecom, they mentioned how they were having some trouble adjusting their internal culture to meet the new National Disability Insurance Scheme (NDIS). 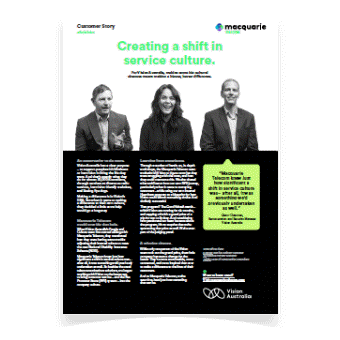 Macquarie Telecom knew just how significant a shift in service culture was – after all, it was something we’d previously undertaken as well. So besides the usual telecommunications solutions, we began working with Vision on the best ways to bring customer service – and the Net Promoter Score (NPS) system – into the company culture. Through a number of hands-on, in-depth workshops, the Macquarie Telecom team worked with Vision to figure out what they were struggling with the most, and how they could overcome this. We also shared what we’d learnt from our own NPS journey, particularly when it came to surveying customers – while using our own internal Heartbeat program as a blueprint for how Vision could launch something similar. And similarly successful. That program? The Good Value Awards – which Vision are running for six months, and capping off with a grand prize of a trip for two to Sydney. And considering how passionate our team became about the program, it’s no surprise that we’re sponsoring that prize as well. We’re even part of the judging panel. While only one person of the Vision team took out the grand prize, the whole company has seen a change for the better. They’re more accountable, more connected, and more inspired than ever to make a difference to the lives of their customers. And at Macquarie Telecom, we’ve seen first-hand just how rewarding that can be. Creating a shift in service culture. For Vision Australia, making some big cultural changes meant making a bigger, better difference. "Macquarie Telecom knew just how significant a shift in service culture was – after all, it was something we’d previously undertaken as well." For WellPet Vets, round-the-clock care meant having round-the-clock tech support. 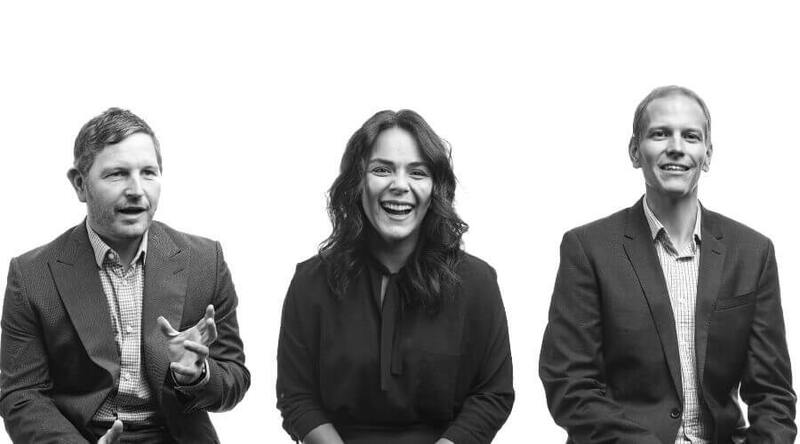 When it comes to connecting a leading Australian company, simplicity is the key. With aging technology and disconnected suppliers signaling time for an update in their telecommunications network - along came Macquarie Telecom. Macquarie Telecom came up with a solution to overcome legacy video conferencing and unreliable communication. River Sands needed someone they could trust to keep them connected, simplify their processes and at the same time, save them some money. Rising costs. Outdated technology. A big office relocation. And one massive headache, in time for Christmas. Impossible? Not for Macquarie. Thanks. We will be in contact.